Chen Ding, son of Chen Mailin, chairman of Nanjing Dingye Investment Group, a property and investment conglomerate, posted a photo of the receipt for a Buggatti Chiron he bought in Vancouver, Canada, on Instagram on Thursday. The taxes paid amounted to C$908,343 ($681,223). "These taxes… my heart feels tired," the younger Chen wrote on the post. 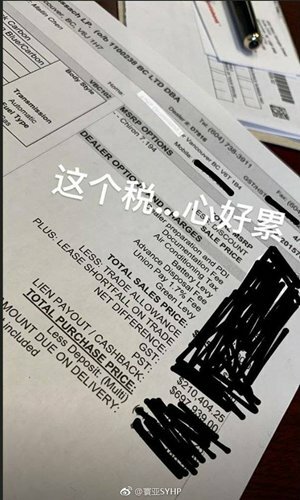 Although he closed his Instagram account, the receipt posted showed it was issued under the name of his father, and listed to his address, a palatial home in Vancouver Chen senior bought in 2015 for C$51.8 million, which is believed to be the biggest residential property transaction in the city, the South China Morning Post reported on Saturday. Chen Mailin, 49, is a former duck farmer from East China's Jiangsu Province, but now has Canadian residency, according to a report in the newspaper Calgary Herald. Many netizens were outraged about the huge gap between regular workers and second-generation rich kids. "So we work hard and do overtime just to ensure that the boss's son can drive Ferraris and live in mansions abroad," Sina Weibo user Juil5 wrote. Many netizens also questioned how Chen transferred so much money abroad given China's strict management of overseas cash transfers. Tu Xinquan, dean of the China Institute for WTO Studies at the University of International Business and Economics in Beijing, told the Global Times on Monday that, according to China's rules on foreign exchange, authorities can control or stop large money transfers overseas. "But many rich people transfer money claiming it is for studying or living expenses, or transfer the money in smaller amounts to evade the rules," Tu said. He noted that this is a gray area because it is difficult to tell what the real purpose of the money is.